We all want to do it, most of us have tried it but most of us started off on the wrong foot all together or just haven’t made it to stainable. MEAL PREP! It’s the unicorn of life. It’s this mystical concept that we know exists and we know people that do it but to us it just seems impossible. Now, Just ask anyone who is done it consistently for months and months and they will tell you is an absolute game changer for many reasons. We live in a society where time is everything. Lives get busier by the day. People are always on the move, working, and running errands. How many times have you said “I wish there was more time in a day”? Having food ready to go can earn you up to 10 free hours during the week. Yes 10 FREE HOURS. Eating out gets expensive especially when you consider the cost of appetizers, your meal, and tipping. Meal prepping will keep you from going out to eat because you will make it so convenient for yourself to eat at work or on the go. Too many times employees eat out during their lunch hour because of convenience and just to join their co-workers but having food ready can prevent this from happening. What if we can get each meal prepped in under $4.00? Sounds great right? This is the reason most of us even decide to start meal prepping. You determine what you eat throughout the week instead of being limited to the restaurant menu. We also get the benefit of portion control. Now we can eat consistently throughout the day eating the right amount of the right foods. Have you ever heard of decision fatigue? It is way more common than you think. Whether you have a tough important job, or you have kids you likely suffer from decision fatigue. Having your food ready each and every day will remove extra choices and thinking you have to do throughout the day. Grocery shopping becomes significantly easier so you can be in and out of the grocery store in under 20 minutes. Whether you want to lose weight, gain muscle, lean out, or tone up the first thing you will probably do is start exercising. Sure, that’s more fun than being in the kitchen and cooking but there comes a time when we need to start thinking nutrition. Once you know what you need to do meal prepping is the next step to success. How much more likely would you hit your goal if you meal prepped every single week? Here is your must have items to make this prep time easier and more efficient along with where to buy them and estimated cost. A lot of these items you probably already have but make sure you grab the items you don’t. ***Some links may be outdated. You will only be successful if you eat the foods you truly enjoy. Sure, you can get a meal plan just about anywhere but what happens when there are foods on there you don’t like? Make a list of your 5 favorite foods in each category. Choose your foods from the list here. Protein – The amount of protein you need (guys vs gals) will vary. A portion can range anywhere from 3-6 ounces cooked or the palm of your hand. Carb (veggies) – This should fill up about half of your meal prep container (the biggest section). This quantity varies (guys vs gals) and will range between 1-2 cups cooked or two fist fulls. Carbs (starchy) – This should fill up about a quarter of your meal prep container. This quantity varies (guys vs gals) and will range between ½ – 1 cup cooked. One cupped handful. Fats – This will go all over your container if you are using oil as your fat. This quantity varies (guys vs gals) and will range from ½ – 1 tablespoon. If you are using nuts use the size of your thumb to measure. First, think about the one meal you struggle with the most and let’s develop that meal. If you are like me and you want to have all three meals ready for the whole week then fill out all three. Use the chart below to start designing. Breakfast Food Quantity # of prepped meals Total weekly qty. 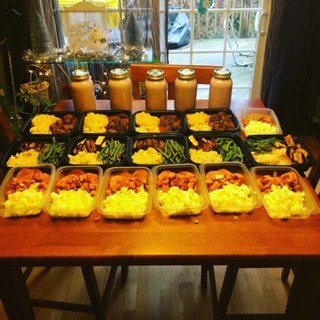 Lunch Food Quantity # of prepped meals Total weekly qty. Dinner Food Quantity # of prepped meals Total weekly qty. ***When you figure out the total weekly quantity of lean meats, know that you will lose some of that while cooking. You should plan to lose 1/3 of the total weight after cooking. The easiest way to figure this out is to take your weekly total quantity and add 50%. Ex: If I need 30 ounces of cooked chicken I would need to buy 45 ounces of raw chicken. 50% of 30 = 15. 30 + 15 = 45. The first 4 steps are the easiest and this is where we get to work. Keep in mind that the first few times you do this, whether you are cooking 5 meals or 15 meals it will take longer than expected and you will make some mistakes. That’s ok and I promise you it will get better and faster. 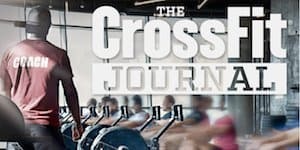 Chapter 5a: Set it and forget it. What are the foods on your list that you can get started and leave to cook for a long period of time? Things like rice, quinoa, and steamed vegetables tend to be the most common. Whether you are cooking your meats on the grill outside or in the oven have a general idea of how long it should take and set a timer so know when to flip them if necessary. Start setting out a couple large bowls or containers and as your meats and veggies are finishing up start consolidating them into bowls or containers. While you are waiting for the last few items to be ready go ahead and start cutting your meat and put the pieces back in the large bowl. At this point all of your food should be cooked but if not, we can still do this step. Find a table or open space and get your meal prep containers laid out. Grab your food scale, measure cups and spoons, tongs and whatever else you need to start separating your food. It’s time to see all that hard work and planning come together. This is the exciting part. With your bowl of meat drop some on the food scale until you get the weight you were shooting for and throw it in each container. With your bowl of veggies use your small or large measuring cup to distribute the right amount into each container. Then do the same with your starchy carb. Lastly add your fat. If you are using nuts then count them out and toss them in the container. If you are using oils, then grab your measuring spoons and dump the oil over your carbs. Throw those lids on the containers and toss them in the fridge. Now celebrate because you just set yourself up for success for the entire week by getting this done. Now you can reflect on what you did and where you can make up some time. Each week you will learn more and more and become better, faster, and more efficient until you can teach the next person how to do it. If you want the full guide then download our Meal Prepping for Beginners E-Book. Our Meal Prep Academy Online Course is designed to take the guess work out completely as we walk you through everything step by step. Register here.